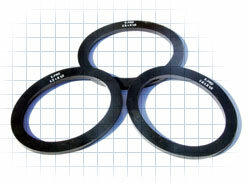 E-Pro gaskets offer the level of service one would expect from high pressure, high temperature, handhole and manhole gaskets. They provide leak-proof, continuous operation. The material below is a peroxide cured EPDM compound designed for high temperature service in addition to the properties generally associated with sulter cured EPDM. The peroxide gives the material a sweet, pungent order which dissipates with time in open air or can be essentially eliminated with an extra process of post curing.